Maybelline is brightening up Spring with their new Face Studio Master Glaze Blush and Master Hi-Light Blush and Bronzer. I love that Maybelline is offering two different, but equally easy, ways to give my face a little colour early in the season. 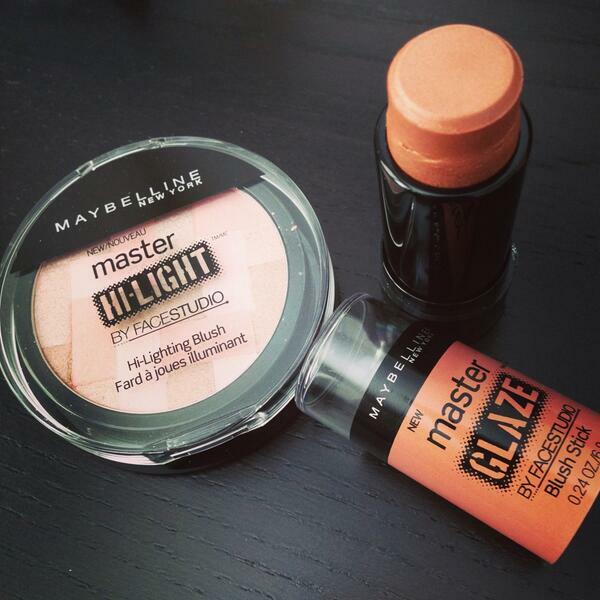 I’m instantly drawn to Maybelline’s Master Glaze Blush. There is something about stick blush that gets me excited even though it can go so wrong if used badly. The stick cream blush comes in really vibrant shades that you can imagine looking either amazing or terrifying. Don’t be scared. The stick is soft and creamy, making it easy to apply. The neon shades blend into a natural hue on your cheeks. It gives a dewy pop of colour that is better than my natural blush. My personal favourite is the bright Pink Fever in the vibrant pink because the colour makes me feel young and flirty again. Next up to get back my summer bronze, we have the Face Studio Mast Hi-Light powder. These palettes have a balance of four shades to give you a bronzed colour that isn’t shimmery. It’s more natural and balanced. There is also a blush version if you prefer a powder to a cream stick, but I like the cream and powder combination. Like most bronzers, you need to apply with a light touch. You don’t want to go from winter pale to dark bronze, because people are going to notice. If you apply a light dusting to your cheeks, forehead and nose those you look like you spent some time on the slopes in sun. So whether you like a powder or a cream, either way, it’s going to be a rose tinted spring.